Figures released today show that 38 out of 40 Isle of Wight schools will be facing cuts to funding up to 2020. OnTheWight has the per-school breakdown. Following the recent announcement on school funding by Justine Greening, the picture remains bleak. As a result of the campaign by parents, trade unions, teachers, heads and support staff to ensure our schools are properly funded, the Government has found £1.3bn over the next two years from other parts of the Department for Education’s budget. This, while important, is nowhere near enough to reverse the £2.8bn in cuts that schools have suffered since 2015. The School Cuts Website – has been updated to reflect the Government’s latest figures on school funding. Don’t let the Government pull the wool over your eyes. Head over to the School Cuts Website, put in your postcode and see exactly how badly schools in your area will be affected. “The bottom line is that the Government has still not found enough funding for schools. 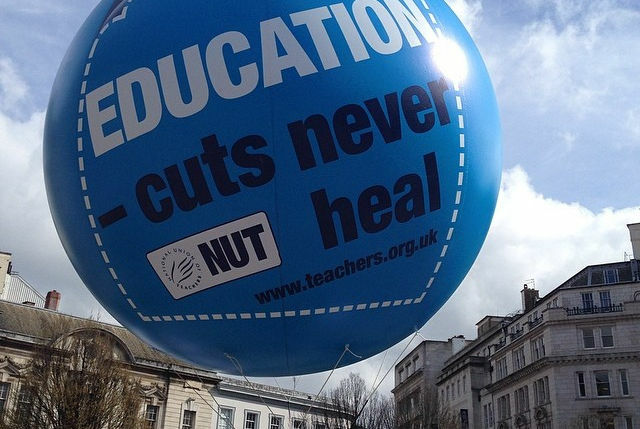 The cuts schools are already having to make are only going to get worse, with most schools being faced with cutting subjects, increasing class sizes, cutting staffing, reducing the support for vulnerable children and providing a less rounded education for pupils. “What is more, parents know that behind every teacher is a whole team helping schools run smoothly, allowing teaching staff to concentrate on teaching. Full details of changes to funding per pupil and per school can be found in the table below. Readers can sort the table by clicking on the arrows at the top of each column. 7 Comments on "38 of 40 Isle of Wight schools still facing cuts, shows School Cuts Website"
But surely we had assurances recently from the latest Tory carpetbagger to ‘represent’us at Westminster that all was going to be well with school funding ? Surely he wasn’t telling fibs ? There is no new money. It’s all previously announced money taken from the existing education budget. It’s a bit like re-arranging the deck chairs on the Titanic. The bulk of that goes to Southern Vectis. The council have a multi million pound contract which we are over half way through.